This baked oatmeal is a great way to start your day. The bananas caramelize and add a ton of sweet flavor, they really shine after baking. Toasted almonds and walnuts add great crunch, protein and omega-3s. Chewy oats provide fiber, making this a filling and lasting breakfast option. It’s definitely a nutritious and delicious breakfast. While this does seem to have a rather lengthy ingredient list, it actually comes together quite quickly. Preheat oven to 375°F. (While your oven preheats is the perfect time to toast the nuts if you don’t have toasted nuts on hand, just spread them out on a baking sheet and take them out when the oven reaches 350°F) Grease a 9×13″ pan with cooking spray and line the bottom with banana slices, set aside. 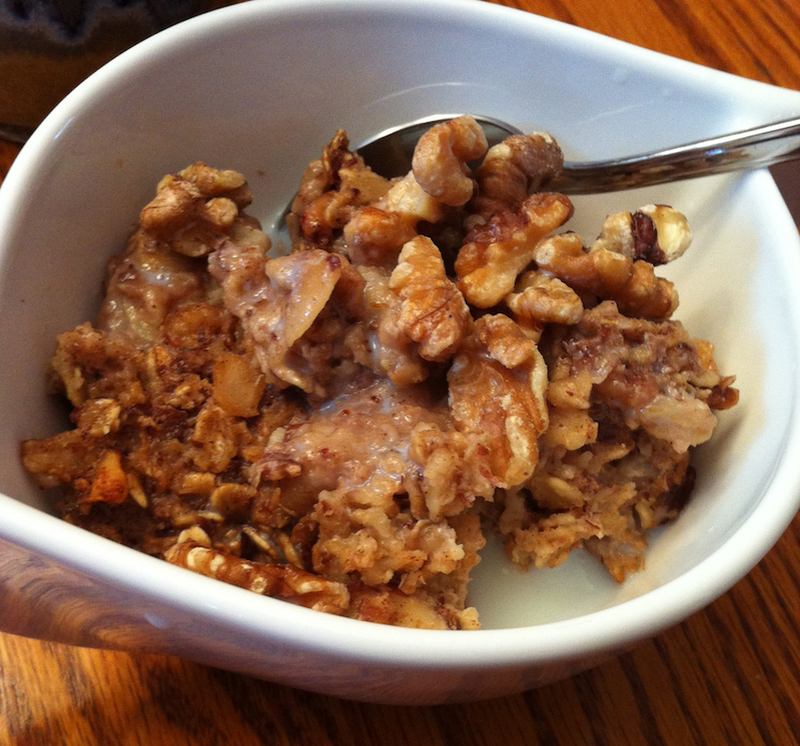 In a large bowl, whisk together oats, almonds, walnuts, flaxseeds, baking powder, cinnamon, ginger, nutmeg and salt. In a separate bowl, whisk together the milk, vinegar, applesauce, maple syrup, eggs and vanilla. Mix the wet ingredients into the dry. Pour mixture over the bananas in the prepared pan. Bake oatmeal until golden and set in the center, about 40 minutes, cover with foil halfway through if it’s beginning to brown too quickly. Let cool for at least 5 minutes before serving. Serve with milk, toasted nuts, banana slices, brown sugar and/or yogurt. Marian just tried the Banana Bread Baked Oatmeal http://www.seat-at-the-table.com/2013/04/14/banana-bread-baked-oatmeal/ and liked that. I’ve tried steel-cut oatmeal in the slow-cooker, but didn’t have much success, and I agree, it takes too long to do it on the stove!